Vico Software Inc, USA has announced its partnership with Mansycom Consultants for India on June 26, 2012. Vico Software's award-winning Virtual Construction™ software help building owners and general contractors collaborate efficiently, improve predictability, reduce risk, manage cost, and optimize schedules on large, complex building projects. Virtual Construction represents a very great change to this industry. Now we have a tool to predict what is going to happen on a construction project with much greater accuracy than we had before. With Vico Office, contractors and stakeholders can leverage the power and possibility of both 3D BIM and traditional 2D plans. From document and change management, to scheduling, to quantity take-offs and resource management, Vico offers a comprehensive workflow for projects of all shapes, sizes, and scopes. With Trimble’s Vico Office, building owners and general contractors can collaborate efficiently, manage costs, and optimize schedules on complex building projects. 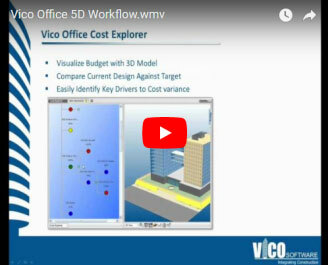 Vico Office is designed as a tightly integrated, BIM-neutral platform to which multiple types of BIM models can be published, synthesized, and augmented with cost and schedule information. By creating a 5D BIM model which incorporates design, estimating data, and scheduling data, a live model is created that is dynamic and responds immediately to changes in the design and on site. Vico Office works out-of-the-box with popular BIM authoring tools such as Graphisoft ArchiCAD, Autodesk Revit, and Tekla Structures. New in Release 4 are publishers for AutoCAD Architecture and AutoCAD MEP. Vico Office also includes additional importers for Google SketchUp, CAD Duct, 3D DWG, and IFC files. Vico Constructability Manager provides an integrated solution for clash detection and coordination resolution so that your team can identify constructability issues in the planning stage before they occur in the field. Vico Office Client is the cornerstone of the Vico Office Suite. Here model versions are managed, information is shared across the team, and an inline reporting engine pulls information from all departments to deliver constructability reports, cost- and resource-loaded schedules, proposed design changes, cost estimates, cash flow reports, and other customizable reports. Preventing errors in construction documents. Faster and precise cost management. Better on-site management and control. 3 to 5 + % cost reduction.